First I'll tell you that a Lafitte Skiff is a local (south Louisiana) shrimp boat. I am building a 1/12 scale model for my grandson. I am using the traditional method and wood - rib and plank out of Cypress - for construction. This is my first attempt at model building and I am going strictly from my memory of time spend on these boats years ago. All skiffs were hand made so no two were exactly alike. Engines went from 170hp 6's to 400+hp V8's, depending on the size and how fast the owner wanted to go. Most were in the 250-300 hp range. Almost all ran 1 1/2:1 or 2:1 reductions. My best guess for the displacement of a boat the size the model is based on would be 7500 to 8000 lbs. My model is 27" LOA with a beam of 9 3/4". I estimate the weight of the finished hull without running gear will be about 3 lbs. This being an open cockpit boat, I have rather limited space available for the running gear, but I have figured a way to make a custom battery pack of at least 6 cells. I could possibly get 7 or 8, depending on the size and location of the motor. I am not concerned about top speed and actually would rather the boat not go too fast as my grandson is very young and would probably have trouble controlling it. I just want it to go fast enough to get up on plane and have a decent run time. First of all, is this feasible? If so, what motor would you suggest? Should I use gear reduction? I have learned that prop selection is pretty much trial and error, but could you suggest a starting point for diameter and pitch? I would like to run a 3 blade for authenticity. If you could suggest sources for the hardware, it would be a great help. In particular, I am having trouble finding a prop strut. The local shops have a very limited selection of boat parts. I did buy an ESC (Traxxas XL-5) and a motor (Cer Mag RS540S) but I have no idea if they will do the job. The shop said the motor "probably" work good enough. I have since found out the motor is an older, discontinued model and I cannot find specs on it. Any idea if these are usable? Thank you for any held you can provide. Good job on that model boat! Looks great! You could use a gear reduction, but you may be fine with the motor you bought. Typically the boat will take a larger propeller and give more run time with a geared motor. Gear ratio somewhere between 1.5:1 and 3:1 is usually good. As to propeller - it goes hand in hand with the motor choice, so lets assume you're using the motor you've got with direct drive. I'd get some plastic propellers in the 1 1/4 to 1 1/2 inch range. Once you know what diameter, pitch and number of blades work best, you can spring for a bronze propeller. You want a "scale" prop, typically with a 0.8 x diameter pitch. Steer clear of anything that says racing, high performance or such. They are for fast boats and will drain any RC battery packs in a hurry. Plastic scale propellers are getting hard to find these days. Graupner USA used to have a bunch, but not any more. I think Dumas is over priced, but it may be your best bet. Hobby Lobby used to be good as well. If you feel confident enough to go with a metal propeller, I'd recommend the Prop Shop in the UK. They make the best looking (and performing) model boat propellers in the world. Prop shafts can be bought from Graupner USA (google them) or the Prop Shop (see link above), Hobby Lobby, Tower Hobbies etc. I'm not sure what you mean by a prop strut. Most scale model boats run a stuffing tube and shaft all the way down to the propeller. 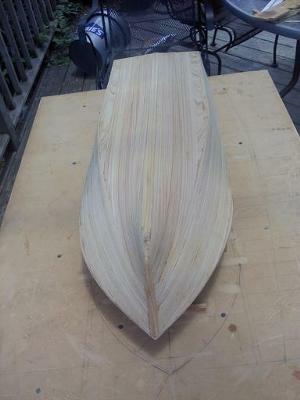 For hard chine boats like the one you're building, I typically attach a skeg (triangular piece of wood) that fills part of the space between stuffing tube and keel. Sounds like the motor is a garden variety Mabuchi RS540. It'll put out around 100W at 7.2V full throttle. I think it's a good match for this boat. In fact, if you use the method of figuring out a model boat motor, you'll find that 100W in the model at 1/12 scale corresponds to 232hp - seems perfect for your purpose. 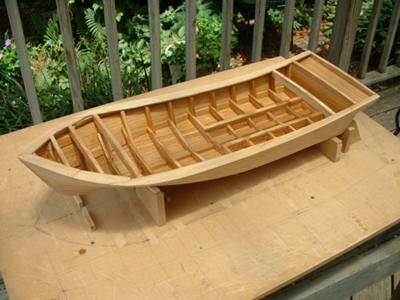 As to the weight, if you are correct about the displacement of the full-size boat, and the model boat is built to a true 1/12 scale the weight of the model will be around 4 1/2 pounds. Being light is always a good thing in my book, you can always load it down with more batteries. I realize you mentioned the boat is open cockpit. I've seen modelers getting around this by disguising the offending gear with a tarp or mock "catch". Just throwing that out there. Feel free to follow up with more questions using the form below. I recently replaced my motor and added the Mack 5045 with heatsink and speed control. I can run more than 30 min now full speed. I can run slow for a very long time. 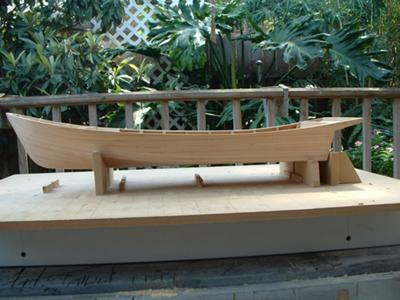 Does anyone know of a set of plans available for the Lafitte Skiff. I would love to build one. I fell in love with the Skiff when I lived in the Lafayette area and fished in Vermilion Bay. They are majestic boats. 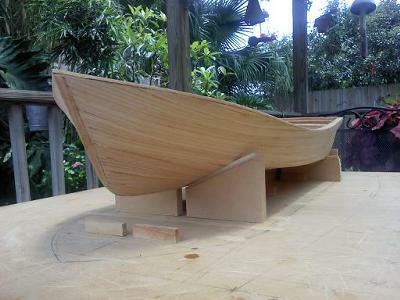 Where did you find the plans to build this boat? I would love to build me a boat like that. I have a 28" fiberglass skiff and I have powered mine with Mack Power Products kit # 701CE Hardware (single screw) with (1)# 5045 motor, (1) # 7300 electronic speed control, (1) # UD-2 Universal, (1) 7004 Y-harness and P-13 Nylon Propeller. I replaced the nylon prop with a three blade octura prop for a real scale look. I run my on two 7.2 volt packs so its fast for about 10 minutes then runs slow for a very long time. You could just run it on one 7.2 volt pack. The boat is going great so far. I am at the point of trying to choose the batteries. What are the pros and cons of running 8.4 vs 7.2 volts? I am using a 2:1 reduction, if that makes a difference. There isn't much difference, really. 7.2V is more common and I bet you could save a few dollars both in the battery package and in the charger. At 8.4V you'll definitely see a boost in power over 7.2 Volt. Question is if you really need it. In fact, I'm quite confident you don't. Thank you for your comments and advise. I feel more confident now about making this work. I am leaning toward using a gear reduction. Would 1 1/2 to 2 inch props be a good place to start expermenting? Also, should I install the radio noise suppressing capacitors on the motor? Again, as long as the props are for scale models, not racing. You need noise suppression capacitors on the motor.